Even before I was a knitter I was not a fan of moths. Something about the way they flap so crazily when they fly around a room hunting for light. I do not like them one bit, and being a knitter they give me extra cause(s) for concern: moths have a tendency of eating your clothing/precious yarn stash/WIPs. The moth that has taken up residence in the kitchen has been there for a few days. He only comes out when I use my Kitchen Aid (I suspect it disrupts the air quite significantly - it certainly does a good job of throwing icing sugar a very long way), and I first saw him on Saturday evening when he decided to fly from wherever he was hiding around the light-fitting for several minutes. I left the room; I cannot abide seeing moths flying around lights. And I didn't think of him again until yesterday (I assumed he'd left through the window that was open all day on Sunday), when he reappeared, did a couple of laps of the kitchen, explored the entire fixed-glass window, and stubbornly refused to fly out of the open pane at one end of the window. The moth spent yesterday evening sat on the window or window frame, moving only when I wasn't looking. ** I would move the moth outside, but I haven't the faintest idea how to move the fluttering creature from the point where it chooses to land to outside without triggering its flapping mechanism, and I cannot cope with that [did I mention that the moth is huge? It is. His body is the length of my thumb (I know that's not huge really, but it is for the UK). I am not going near it.]. So the moth has stayed; not that I know where he is, he's moved from the window and I haven't seen him since last night. Clean all your clothes, knits and yarn before putting them away (this includes new-to-you items such as vintage clothes or newly-acquired stash). This removes any moth eggs, preventing them from taking up home in your yarn collection. If you're storing an item that can't be washed (e.g. new yarn), put the item in a plastic bag and store it in the freezer (at between –18 and –25 degrees C) for at least 48 hours to kill off any eggs that may be in the item. Clean your cupboards and other storage frequently: vacuum, wipe down with detergent and make sure everywhere gets the once over. Insects don't like to be disturbed, and are particularly keen on dark corners. 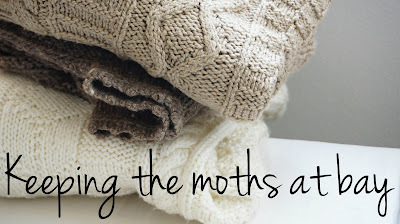 Store your clothes and yarn in moth-proof containers, e.g. heavy-duty cotton garment bags or plastic boxes. Put moth repellents in your storage containers: cedar and lavender both work. With cedar, you should sand the wood using fine sandpaper every year so that it continues to produce the smell that moths dislike. Replace lavender bags (or top up with lavender oil) every so often so they continue to smell. 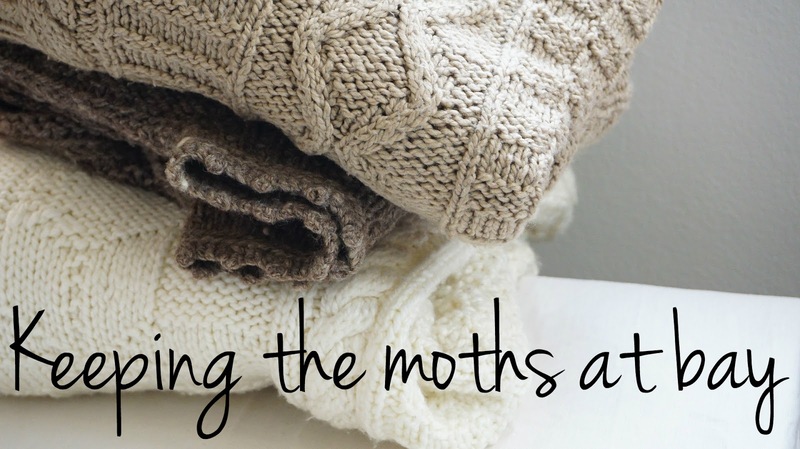 Inspect your stash and clothing regularly for signs of moth damage. If you find any, clean everything. If you find you have a major infestation, call out the fumigators and get rid of the moths for good. I tried to find some pretty photos for this post. But I will confess that I really struggled to even look through the pictures without feeling rather squeamish! *Heebie-jeebies: a state of nervous anxiety or fear. **Ugh. Yes, that freaked me out too. It's not paranoia if they really are watching you.